Harris’s lecture will discuss conventional assumptions in theological and philosophical discussions of miracle that science can be adequately dealt with simply by invoking ‘the laws of nature’, such that a miracle transgresses these laws. He will talk about the shortcomings of these assumptions, arguing that there is a need to address wider underpinning concepts in the philosophy of science, including naturalism, the uniformity of nature, and the unity of science. Harris will suggest new ways forward for thinking about miracles by bringing in insights from debates in geology. Mark Harris studied geology at Cambridge University before moving into mainstream physics in Oxford, first in a postdoc at the University of Oxford, then in a staff position at Rutherford Appleton Laboratory. For about 10 years, Harris established his interests in the physics of magnetic materials. 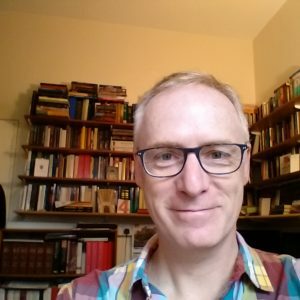 After exploring a calling to ordination in the Church of England, Harris read theology at Oxford in the early 2000s, and moved into parish ministry and university chaplaincy. In 2012, Harris constructed the University of Edinburgh’s new master’s program in science and religion and has been a director of the program ever since. Harris’s teaching and research focus on the relationship between Christian theology and the physical sciences. He is especially interested in the impact of science on modern views of the Bible, especially in thinking on miracles and divine action. Harris is in the process of working on a book project on naturalism, and the ways that historical debates on naturalism in geology provide a new way of looking at miracles. 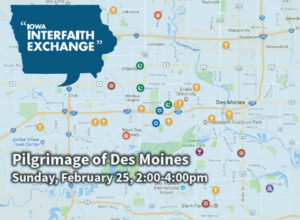 This year’s Iowa Interfaith Exchange takes place over two days.